In 1958, Soichiro Honda felt satisfied; he had just launched his first high-performance twin, the C70. However, his business associate, Takeo Fujisawa, argued that it was time to do something new for the bottom end of the market. That was where the customers were, those who had ensured Honda's success. Fujisawa's idea was readily expressed: "We must combine the best of motorcycles (stability), cyclemotors (economy) and scooters (cleanliness)." The Super Cub had large wheels for stability and used pressed-steel and plastic for economy (though large initial investments in plant and equipment had been necessary). Its tiny horizontal four-stroke engine and drive chain were enclosed to isolate the rider from the mechanism. An automatic centrifugal clutch made this quiet, comfortable little machine easy for nonmotorcyclists to ride. It was a stupendous commercial success. Only in 1981 and 1987 did the annual output levels dip below 450,000. The 20 millionth Super Cub left the production lines on March 18, 1992. By now, the model has probably beaten the record of the VW Beetle as the most produced vehicle in the world – it has certainly pushed the Model T Ford into third place. Today, the Super Cub is sold in 120 countries worldwide, built in a dozen of them, and catalogued in many versions and engine sizes. 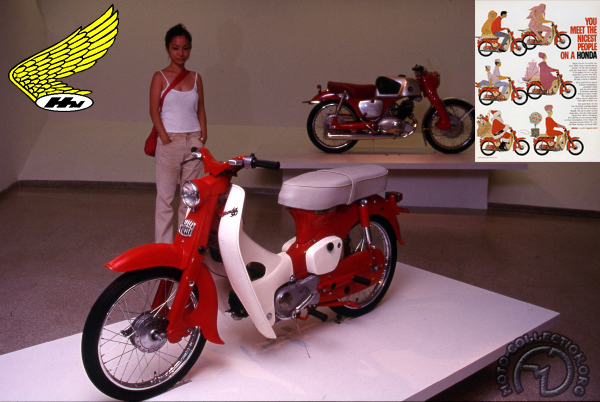 The Super Cub has become the symbol of motorized progress in every developing country. Probably the most popular motorized vehicle in the world, the Honda Cub has sold well in excess of 20 million units.